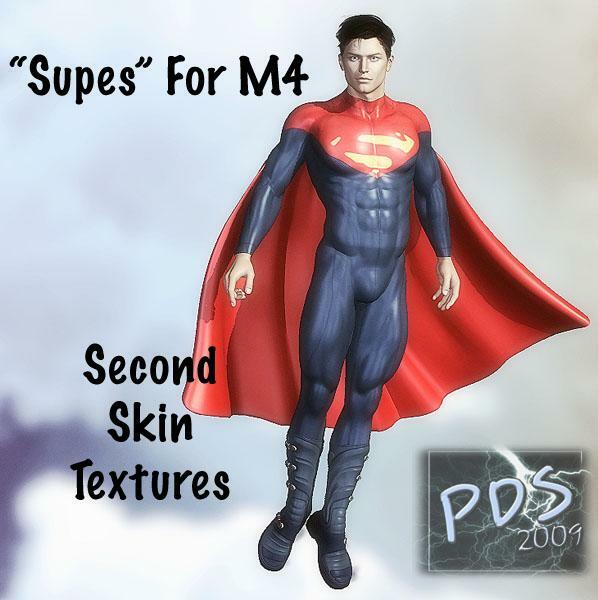 "Second Skin" texture set and Poser MATs for Character inspired by Superman. quietrob (1 year ago) Inappropriate? samaelarkin (6 years ago) Inappropriate? Crikett (6 years ago) Inappropriate? I can't comment on DS compatibility as I do not use it, but I was not able to replicate any problems in 2014 (loaded up for me without any problems); you may want to make sure you have all the files in the same runtime (or at least links to them in other runtimes). spinello1234 (6 years ago) Inappropriate? jlemus (7 years ago) Inappropriate? much better than the one in the comic! Crikett (10 years ago) Inappropriate? The cape is the DAZ Hooded Cloak with a transmap applied (and the boots are the M4 Trekkers). fcabanski (10 years ago) Inappropriate? Where can the cape be found?